On October 4, 2003, during the genocidal assault known as the Second Intifada, a young Palestinian law student from Jenin named Hanadi Jaradat blew herself up at Maxim's restaurant in Haifa. The blast killed 21 people including four children and five Israeli Arabs. Two of the children (aged 11 and 9) were from the Almog family, which lost five people in the bombing; another two of the children (aged 4 and 1) were from the Zer-Aviv family, which also lost five members. Since then, the honors for Hanadi Jaradat have never stopped—and not only from Palestinians. to an international conference on preventing genocide. Mazel was shocked to encounter there a large exhibit glorifying [Jaradat]. Dubbed "Snow White and the Madness of Truth," the exhibit showed a tiny sailboat floating on a pool of red water. Attached to the boat was a smiling photo of the female bomber…. Mazel, in an incident that gained much notoriety at the time, reacted by "pull[ing] the plug on three spotlights illuminating the exhibit, and knock[ing] one light fixture into the red pool." His Swedish hosts were shocked at the uncivilized behavior. In 2005, the Palestinian Authority's Ministry of Culture published a poetry collection in Jaradat's honor, distributing it with a daily newspaper. Neither the Swedish artist nor the Ministry of Culture was deterred by the fact that Jaradat's victims included Arabs—two waiters, a cook, a security guard, and a man responsible for customer service at the restaurant. Now Palestinian Media Watch informs us that Jaradat's folk-hero status lives on. 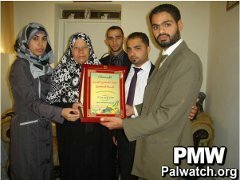 Last week the Palestine Committee of the Arab Lawyers Union created something called the "Martyr Hanadi Jaradat plaque of honor" and presented it to Jaradat's family in a visit. The delegation conveyed to the family of Martyr Jaradat the good wishes of the head of the Union, Mr. Omar Al-Zayn…and also emphasized the pride of the Arab Lawyers Union for what their daughter had done in defense of Palestine and the nation. The Arab Lawyers Union is based in Cairo, and its website says it "is in consultative status with ECOSOC, an observer at UNESCO…and a member in several UN committees." Its mission statement includes the item "Promote and protect human rights, basic freedoms and the primacy of law…." Amid the upheavals sweeping Libya, Egypt, Syria, Yemen, and elsewhere in the region, the Palestinians have been out of the spotlight lately. And as Israel gears up for elections on January 22, even the left-of-center parties—for the first time in decades—are so far giving the Palestinian issue short shrift. I don't know what's gong on [in Israel]. On the one hand I read about public opinion polls showing that 70% of Israelis want peace with us, but on the other hand there is no process and we identify a lack of interest on your part…. The Palestinian issue is not on the agenda of the [Israeli political] parties…. The Likud is dealing with the Iranian threat, Labor with the price of cottage cheese, and the elections serve as just another excuse to delay [the resumption of peace talks]…. I see now how Netanyahu is destroying the two-state solution. Again, though, those who keep up with Palestinian Media Watch will not be too impressed with Abbas's commitment to Israel's continued existence as one of the "two states." As his Facebook page put it earlier this month: "we are right that our land is occupied and not disputed territory, and this applies to all the territories that Israel occupied before June 1967." In other words, "our land" includes not just the West Bank and Gaza but Tel Aviv, Haifa, and all the rest of Israel as well. facing relentless waves of attacks against our people, our mosques, churches and monasteries, and our homes and schools; they are unleashing their venom against our trees, fields, crops and properties, and our people have become fixed targets for acts of killing and abuse with the complete collusion of the occupying forces and the Israeli Government. With elections on the way in Israel and especially in the United States, there is no knowing if 2013 will see the Palestinians return to prominence—or stay in the relative insignificance that is so frustrating to Abbas. From both moral and pragmatic standpoints, the culture that produces and glorifies the likes of Hanadi Jaradat is very lucky to have the autonomy and aid money it now has, and—to say the least—deserves nothing more. Click on link for complete story. Female Palestinian suicide bomber Hanadi Jaradat, who killed 21 Israelis and injured more than 50, has been chosen worthy of "the highest honor" by the Palestine Committee of the Arab Lawyers Union. The Palestinian daily Al-Ayyam reported earlier this week that the Arab Lawyers Union had "created the ‘Martyr Hanadi Jaradat plaque of honor,'" which a delegation presented during a visit to Jaradat's family.